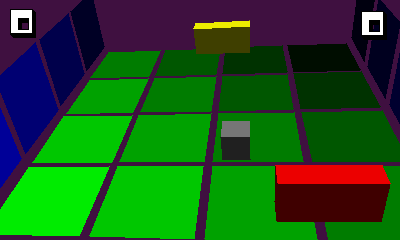 This is just a 3D pong, inspired by my old Pong 3DS for Nintendo DS. This was a test to see if I could manage to setup a correct perspective for stereoscopic 3D, but I decided to make a simple game out of it. If anyone cares, the 3D engine can draw lines, triangles, quads, line strips, triangle strips and quad strips, all of them With alpha blending. Quads are drawn using a function used just for them to draw them faster, not by drawing two triangles. 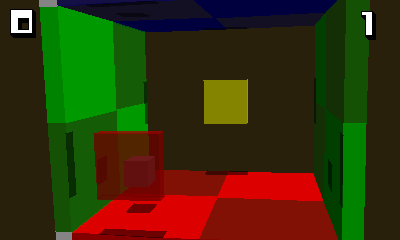 It supports directional lighting (up to 32 lights, limited to 2 because why more) and ambient lighting. It can sort polygons with painter's algorithm (no buffer-Z). It doesn't support textured polygons. Oh, the 3D slider actually does something when you change its position. The engine renders each top screen in a separate core when working in 3D mode to make it run always at the same FPS. 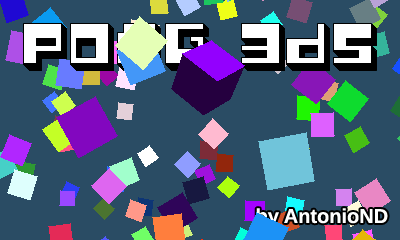 Press Y to take a screenshot in PNG format (2 files in 3D mode, 1 in 2D mode) or SELECT to exit. 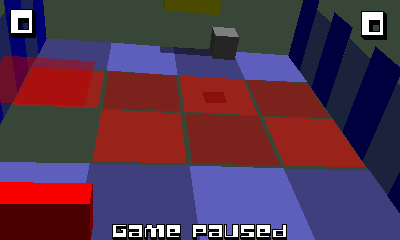 Use the joystick to move the pad, and A to jump in the 2.5D room. For now, in the main menu, press a button in the touchscreen to enter a game room. Pressing START in a room will return the game to the main menu. Holding L and R at the same time will show the FPS and the CPU usage. This game is licensed under the GPL Version 3.